I just wanted to check in with a quick post today because I’ve got to get back to three majorly cute dogs running around the house. We’ve got an extra set of paws with us this weekend, so Maui and Hilo are having a blast chasing their new friend around! 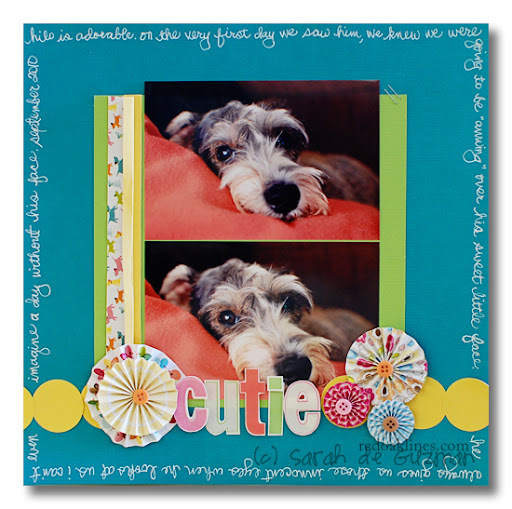 For details on this layout, check out my post over at Scrapbooking Supplies R Us. Please share with me what white pen you are using. I’ve had such bad luck with my white pen purchases and just love the look. Have fun at the crop! super cute. love the rosettes, the colors and the super cute photos. see you soon. WOW!!!!!!!!!!! I just love this! I agree, what pen are you using????? I love the little pleated circles. Too cute! Great use of your punch too. I always want a border and only have 1 border punch right now, such a shame! I love, love, love the pleated circles! They are adorable! Great photos of your furbaby too! I love the journaling around the outside. Great page! he is super adorable, and love those circles. Have a great weekend, can’t wait to see what fun pics of the “3” fur babies you put up, it’s great that Maui and Hilo get along so well with everyone. Super cute! I love those colors. Have a fantastic weekend! This is a REAL CUTIE!!!! Love that line!!! Have fun with the furbabies!!!! Too CUTE… loving the white pen for journaling! Trying to catch up on all my favorite reads! So happy for your loss! Weight loss, that is! 😀 That is fantastic – just keep on and your will reach your goal in no time!! Saw the post on FB about winning the CK reader contest – so so happy for you!!! You definitely deserve it with all your artsy/scrappy talent. 🙂 Hope your week is filled with blessings. OOOOHHHHH I love that adorable face!!! And I love the contrast of the colors! A great LO! this layout is super cute! love it!